Here is our wonderful post on Language Arts. As humans, we use language to communicate as soon as we can; it is only right to study the wonderful subject of language (grammar, spelling, reading, writing). 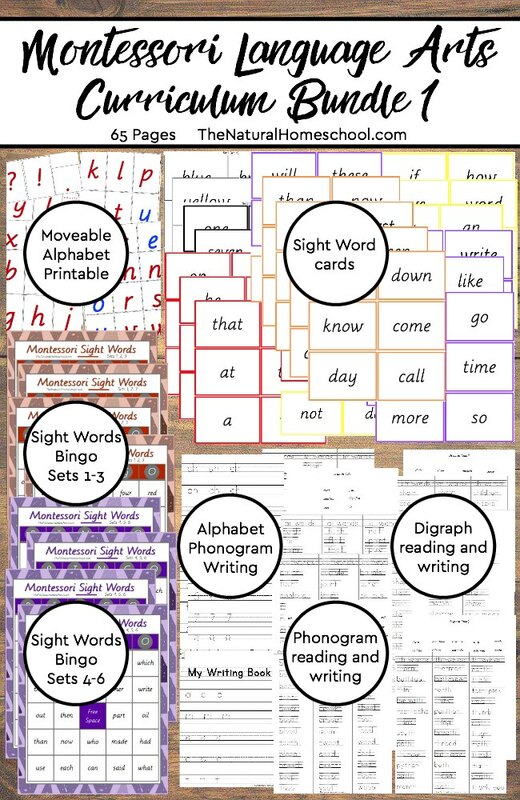 In this lesson, you will see sorting, matching, naming labeling and learning noun words while labeling them as such. 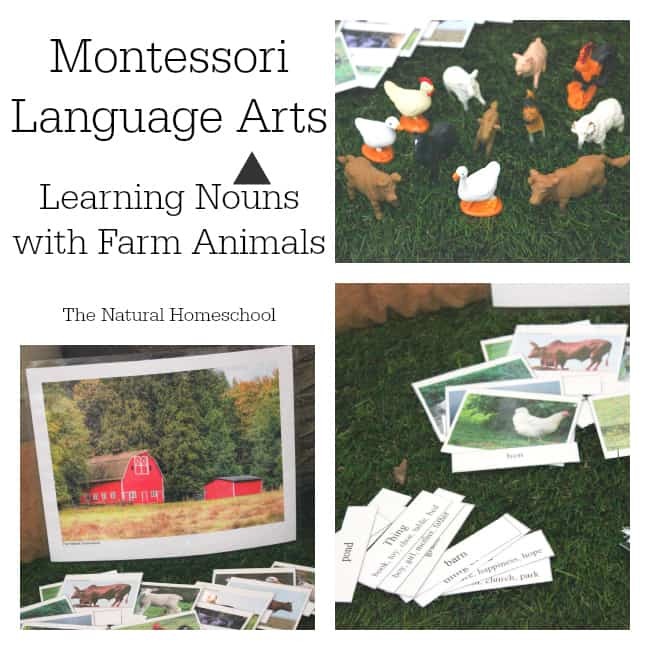 I love using the farm to teach nouns. 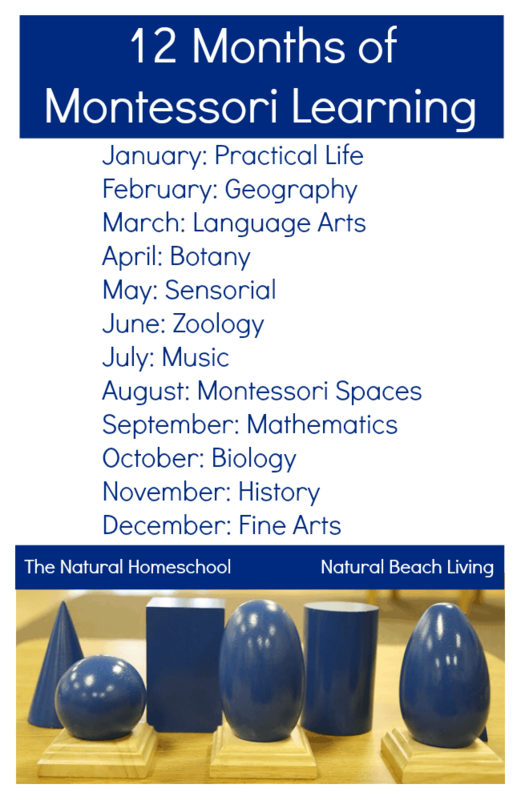 I hope you find inspiration to try this lesson with your children and/or students, especially that you enjoy the FREE printables. This is so easy! 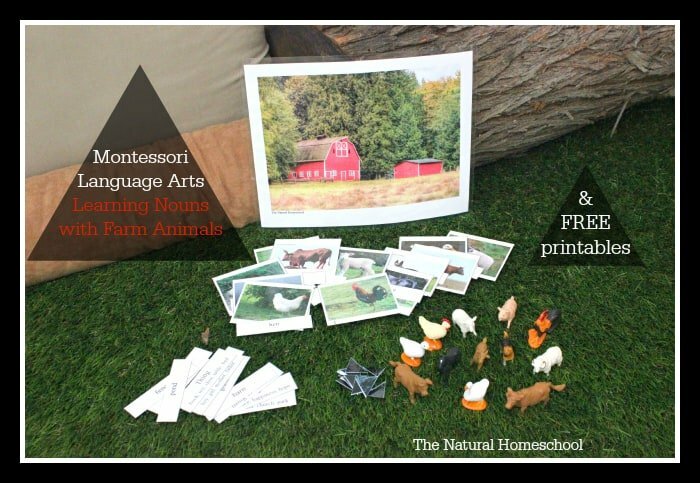 All you need is the set of FREE printables you can find in this post and one set of these mini farm animal replicas. 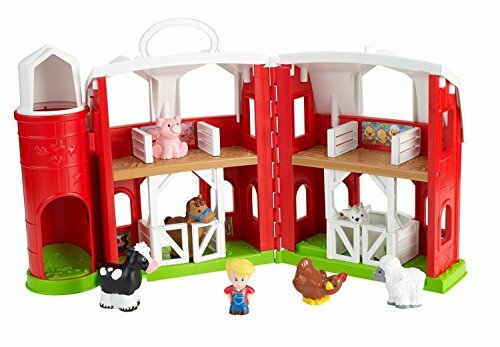 Print the barn image in color on cardstock and laminate it (unless you have a toy barn at home). We used to have one, but got rid of it, so I made something that is nice, durable and that it doesn’t take up a lot of room. 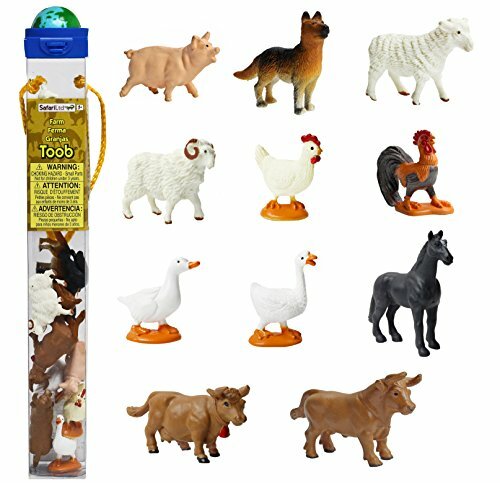 The animal cards can be used for so many activities! It is amazing! I will tell you several things you can use them for. For the animal cards, if you want to use them as 3-part cards, print the set twice in color and laminate them. Having two sets can never hurt. 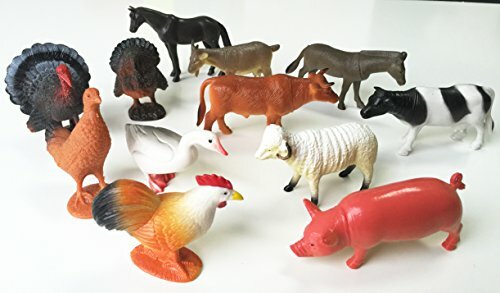 For the mini farm animal replicas, you can use any set of animals you can find, but I highly recommend these because they are the best. Hand-painted, no toxic chemicals in the paints used and they are high quality. They are very durable and very affordable. 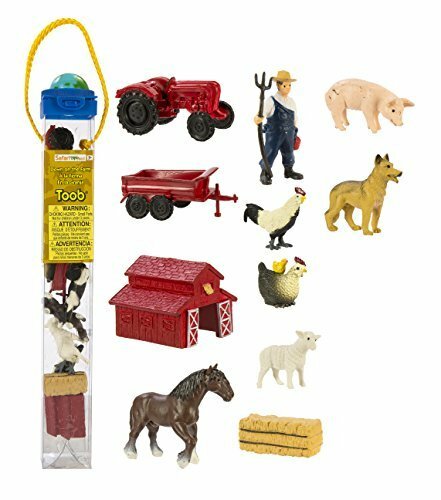 There are many sets that you can buy, including farm baby animals. 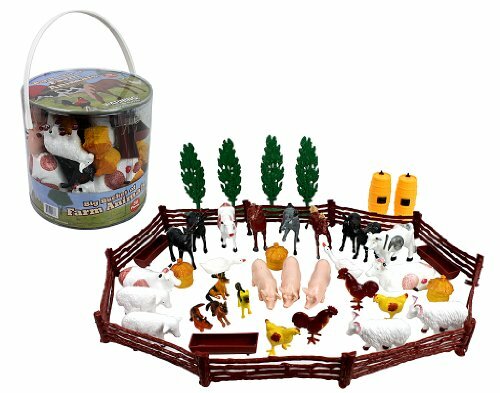 I bought the regular farm animals set for this activity. 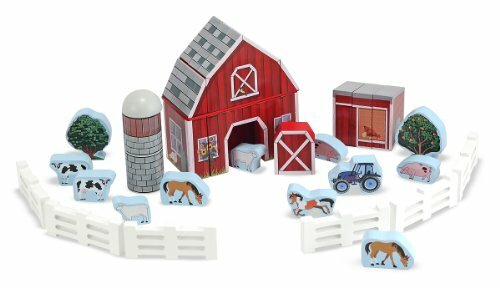 Below, you can see how I set up the barn picture, the cards, the labels, the noun triangles and the mini farm animal replicas. 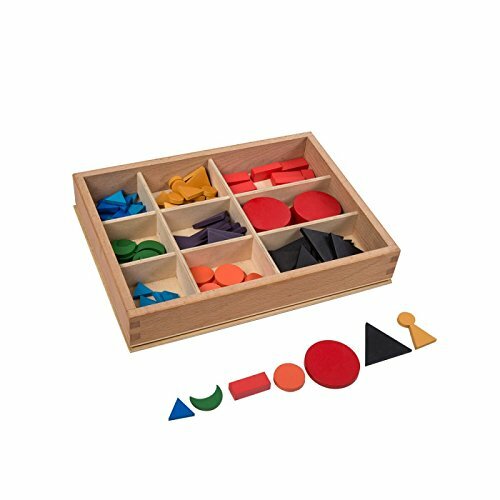 I used a bamboo placemat for this activity (the size of a regular placemat), but you can certainly use a regular 2×3 natural fiber mat that is regularly used in a Montessori classroom. 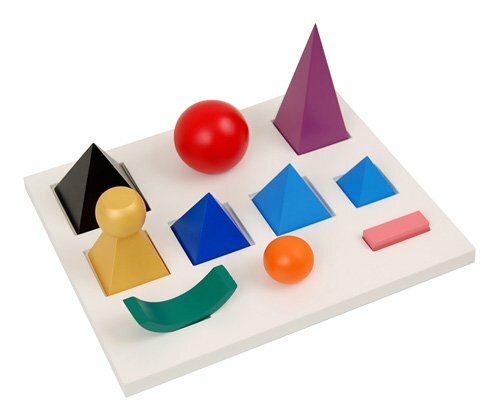 This activity was fun to do on the floor, but it can also be done at a child-sized table. First, I used the two labels you see in the first picture below. Place the noun and the definition of a noun labels on the natural fiber or bamboo placemat. We talk about that for a little while. Then I place the detailed labels below the two main noun labels. Talk about the details of each category: person, place, thing, idea. We come up with more examples for each category. 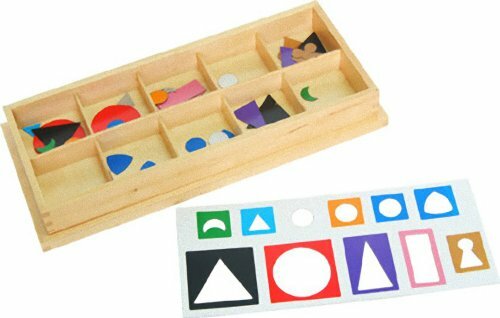 Finally, I place one large black triangle and tell children that nouns are represented by it and the large black triangle is placed above the nouns. I printed TWO (2) color copies of the animal cards set (pages 2-4) on white card stock and laminated them using a thermal laminator. Then cut them with a guillotine. It is important to point out that one set of cards is cut with words and pictures together. The second set of cards was cut like the first set, except that the pictures and the words were cut separately to make them 3-part cards (the cards with picture and words, the picture cards and the word cards). I use a zipper baggie (sandwich size) to keep them together. To use them, you place all 12 cards (with image and name) on the placemat. Then, child matches images and places them next to each other. Finally, the child matches the animal name labels and places them under the correct image. We placed all 12 animal picture cards (one copy of the printable set) on the placemat. Then my child went through each animal name label and placed them underneath the correct image. 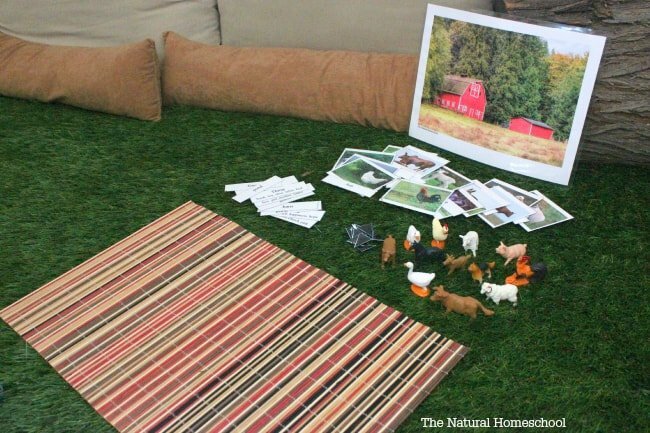 Finally, she placed the mini farm animal replicas over the correct picture. We placed the mini farm animal replicas on the placemat. My child placed the correct animal name cards right above the correct animal, labeling each animal with the correct name. Finally, she placed a large black triangle above the animal name label to certify that all names are nouns. We talked about nouns again. Our last activity took our items away from the placemat (you won’t need it anymore). 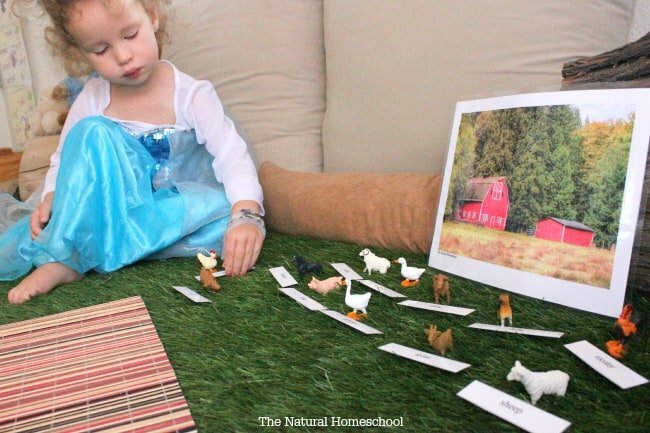 “Elsa” took the mini farm animal replicas and placed them near the barn. Then she began naming each animal and placed their name labels by them. After that, she took one large black triangle and as she placed it above the animal name label, she would say, “‘Sheep’ is a noun. ‘Horse’ is a noun. ‘Goat’ is a noun.” and so on. I hope you find this hands-on lesson fun and doable. 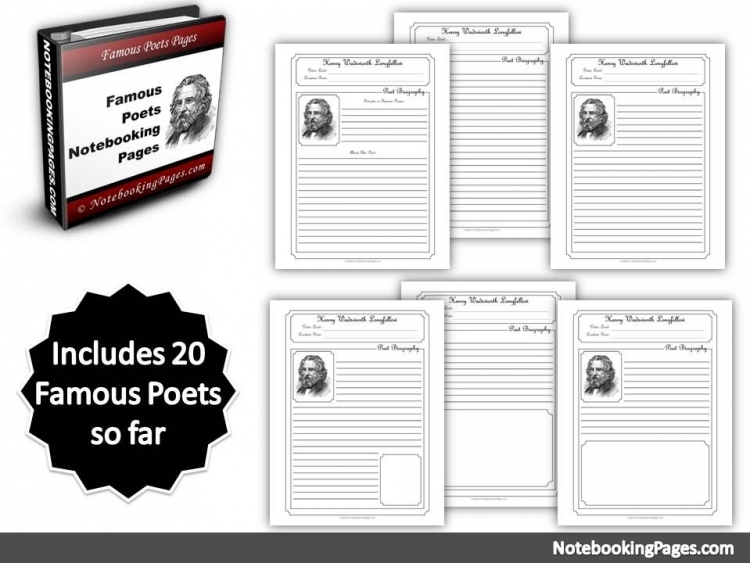 You get so much out of one FREE set of printables! 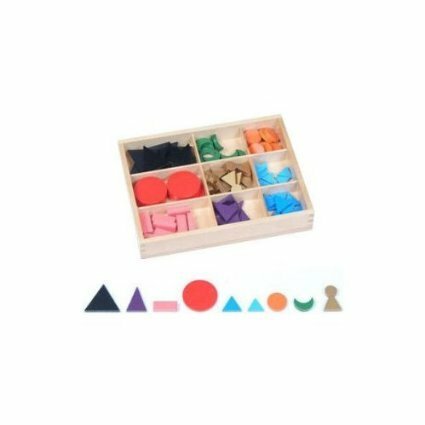 Can you think of other activities you can make with this set? Let us know! We’d love to hear! Now it is your turn! Come and get your two lovely printables! Enjoy! And this isn’t all! 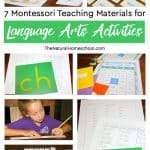 Take a look at the other Montessori Language Arts posts our lovely group has written. Don’t miss a thing and sign up to receive a reminder EMAIL every time these series posts go live! Thank you! We had fun with our farm animals. 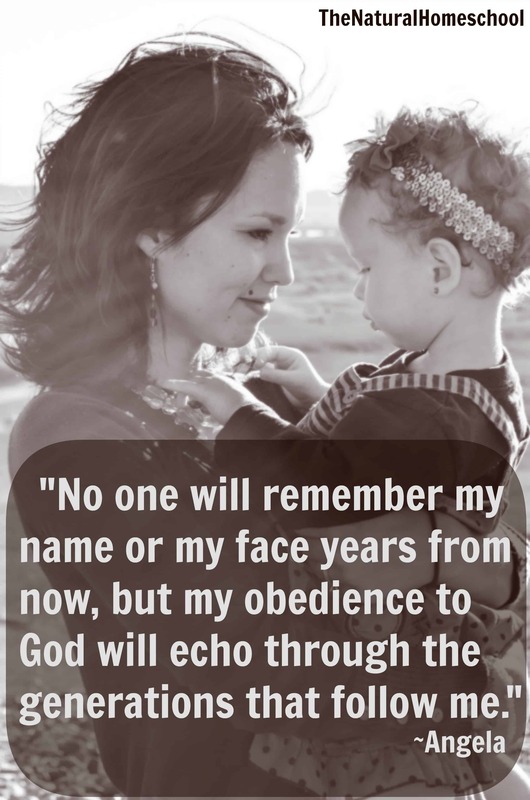 Love, love, LOVE this post! 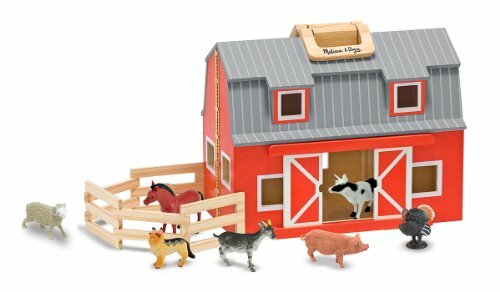 I especially enjoy the idea of a printable barn. So many great explanations and activities. Can’t wait to share! This is a great post! 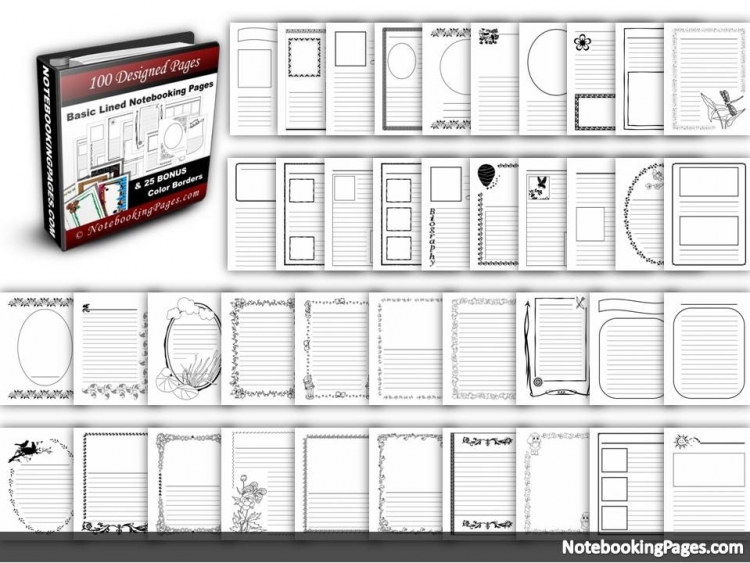 I love the printable and will be using is ASAP. Thanks so much for the printables! I love how simplified yet precise your instructions were — very easy to follow and implement! Thank you so much! I believe children learn better when it is engaging and attractive, not merely entertaining. 😉 You are so sweet! Just love this. We just got a barn handed down to us. I can’t wait to set this up for my kids. Thank you for the inspiration! I love your beautiful, open spaces for learning!!! Such gorgeous activities! 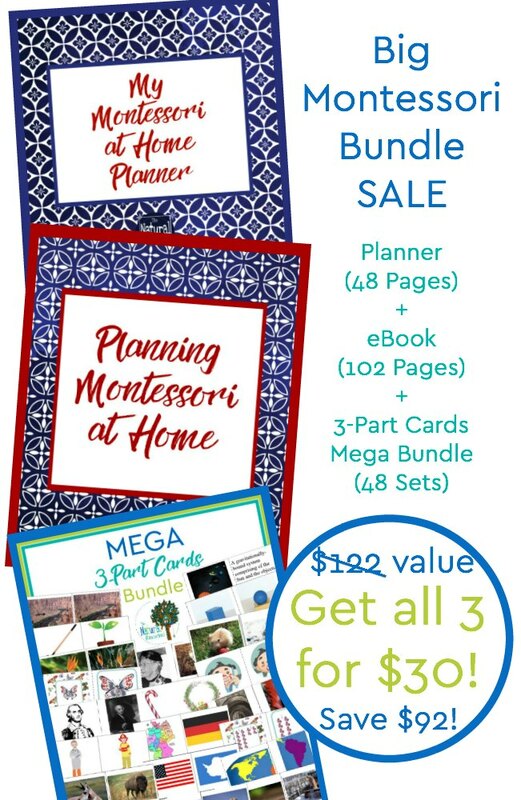 Thank you for sharing with Kids Learning Printables Linky Party! Love this what a neat idea!